Zhenyu “Henry” Huang was elevated to the grade of Fellow of the Institute of Electrical and Electronics Engineers. 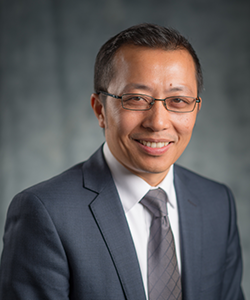 Engineer Zhenyu “Henry” Huang was named a Fellow of the Institute of Electrical and Electronics Engineers (IEEE) for his contributions to dynamic analysis and high performance computing in power systems. The grade of Fellow is awarded to researchers with an outstanding record of accomplishments in any of the IEEE fields of interest. Less than 0.1% of voting members are selected annually for this member grade elevation. Huang’s new title takes effect Jan. 1, 2017. The IEEE is the world’s leading professional association for advancing technology for humanity. With more than 400,000 members in 160 countries, IEEE is an authority on a wide variety of areas ranging from biomedical engineering to electric power. Huang earned his Ph.D. from Tsinghua University in China. Since joining PNNL, Huang’s research has included high performance computing, phasor technology, and power system stability and simulation. He is the manager of the controls group, and has over 80 peer-reviewed publications to his name.